Last night, Adam and I went over to our friends Ashley and Jesse’s house for dinner. Ashley just had a baby a month ago and she’s such a precious little peapod that it makes me want a puppy….or something. Just kidding!! Well, not really. I still want a puppy. Anyway, since Ashley was doing the cooking I said I would bring dessert. We were doing a National Day of Prayer slash Cinco de Mayo theme, so I decided to try my hand at tres leches cake. Note that before yesterday I had never attempted tres leches cake before. Heck, I had never even TRIED tres leches cake before, which is pretty much a mortal sin since I used to live in Tampa where delectable milky slices would sit in Cuban bakery windows all over town. Okay fine, I’ll just say it. Before yesterday I thought tres leches cake sounded absolutely disgusting. I mean, who wants to eat a soggy milk cake? Thanks, but I’ll take the flan. However, I stumbled across Ree’s recipe yesterday morning and something in it enticed me. It probably was the fact that the entire cake was covered in whipped cream…or the fact that she called sweetened condensed milk “the sweet nectar of the south”. And guys, it turned out ridiculous. And by ridiculous I clearly mean fabulous. Even though I baked it in the wrong size pan (what? It’s not like I bake for a living or anything) and ran out to Target immediately after with the cake cooling on a cutting board to buy a cute cake pan. This cake deserved a cute cake pan. It was soggy, but totally not in a bad way. No, soggy as in tiramisu soggy. Soggy as in irresistible vanilla cake soggy. Does that make sense? The only reason you should not try this cake is if you are severely lactose intolerant. That would probably be a bad idea….but just worth the stomach ache. Let it be known that I added a (very) healthy dash of vanilla rum to the milk syrup and also added cinnamon to my whipped cream. 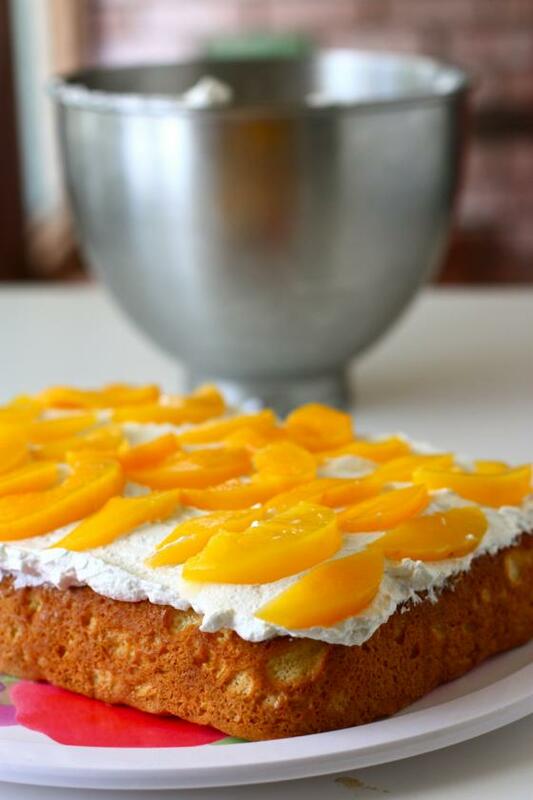 And since maraschino cherries scare me, I topped my cake with canned peach slices instead. Even if it didn’t quite fit in the cute cake pan. Separate the eggs into two bowls. I’ve found the easiest way to do this is standing over the sink, cracking an egg and letting the whites slip through my fingers into one bowl then placing the leftover yolk in the other bowl. Kinda messy, but efficient. Once your eggs are separated, beat the yolks with 3/4 cup sugar on high speed until very pale, thick and ribbony (about 5-8 minutes). Add the milk and vanilla and gently mix until combined. Fold in the dry ingredients carefully (be careful not to over-mix). Set aside. 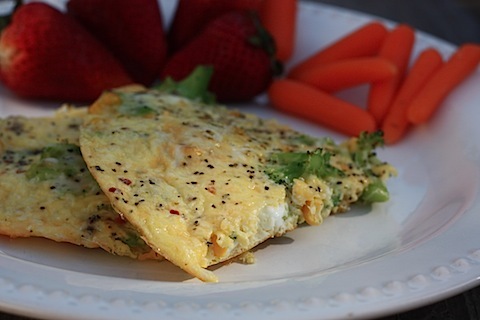 Wash your bowl and then beat the egg whites on high until frothy. Slowly add the remaining 1/4 cup sugar and continue to beat on high until stiff peaks appear. Fold this mixture into the other with a rubber spatula, mixing only until just combined. Scoop batter into greased pan and smooth top as best you can. Bake for 35-40 minutes until golden brown and edges start to pull away from the sides. Turn cake over onto serving platter and let cool while you make the syrup. For the syrup, mix together the condensed milk, evaporated milk, rum and cream. 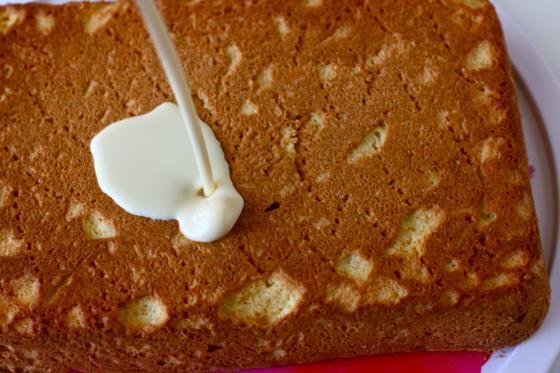 Prick cake all over with a fork and then slowly drizzle syrup all over cake. The cake will absorb it all just like a sponge! Place in the fridge for 30 minutes (I chilled for an hour) and then make the frosting. Beat the cream, sugar and cinnamon until thick. 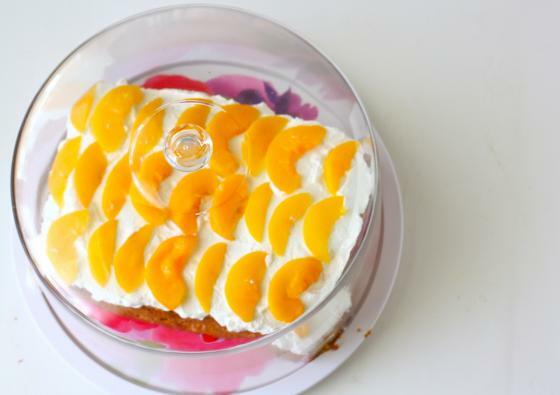 Spread over cake and serve plain, cut into squares, or decorate with fruit such as canned peaches, maraschino cherries (gag) or thin mango slices. cinco de mayo recipe roundup ribs and corn, oh my! I’m dying for a puppy, too! I don’t think I’d be able to leave for work though if I had a cute, cuddly puppy at home. Jenna that cake looks SOOOO good. Wow. Haha, love your writing style. You explained that “adventure” perfectly 😉 I was laughing the entire time. The dessert looks amazing! Totally impressed. I’ve never tried tres leches cake either, but yous looks amazing!! You’re right, there’s gross soggy, then there’s super amazing tiramisu/vanilla cake/tres leches cake soggy… and that’s perfectly fine by me! Looks incredible! Always wanted to make this. How ironic, I just had tres leches for the first time this week while in Peru! Wow, Jenna! you did an amazing job on this! I have never attempted a tres leche cake but you give me hope! I love the frosting and the peach slices on top. I’ve never heard of Tres Leches cake before. IS it a Cuban specialty? Sounds weird, but I like soggy cake. Even if it is tiramisu soggy. And this one has to be a winner. I’ve never had tres leches before. It sounds amazing!! I love Tres Leches Cake!! Its absolute heaven to me! This is one of our favorite cakes too! It was the first PW recipe I ever made. So good! Looks delicious- LOVE tres leches. Like the idea of topping w/ peaches too! My husband is Cuban, and this is his absolutely favorite cake. I’ve tried making other versions of tres leches cake, but not Ree’s yet. But there definitely is something about this cake that tastes like magic! This is completely hilarious (about the cake pan) and looks delish! I think its a must try–maybe for my mom for mother’s day! 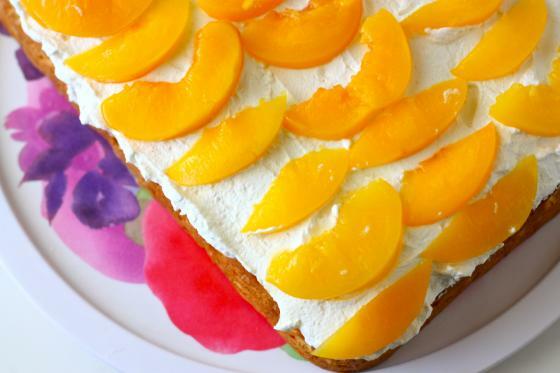 That cake looks so delicious — the peaches on top look super cute! What kind of rum should you use if you are going to make this cake? I know nothing about using rum in cooking…..or just rum itself period. You are killing me! this looks super yummy! I’m tryin the french toast bake for my mom. There is nothing better than tres leches. You are seriously my new HERO! Tres leches is one of my all time favorite desserts (that and Tiramisu). It is very hard to perfect the cake. Sometimes they turn out too dry…which, for this cake, is a terrible, terrible thing. Even grocery stores mess them up. I am from Austin, Texas and we have several places in town that you should try next time you are in town for some awesome Tres Leches. You will soon become a Tres Leches connoisseur. FYI….some other variations to the cake are coconut milk added in with the milk mix and toasted coconut on top….or, probably the most common, fresh strawberries with cajeta and chocolate drizzled across the cake. Oh man….you just made me want a slice! Oh….and chopped up pecans is very popular too! I’m from Austin as well, and have to concur that we have some amazing Tres Leches in this town. My husband is Argentine, so our Tres Leches gets doused with dulce de leche as well. And, well, it’s heaven. Obviously. YUM! Love the last picture! Vanilla rum? I like your style. This recipe looks yum! tres leches makes mouths happy. truly, truly happy. p.s. Love the cake pan! beautiful cake, beautiful pan. amazing as usual! That is my favorite dessert right now! That exact recipe. Although I added coconut milk in place of the cream for the tres leches part last time and toasted coconut on top. Delicious. I for one adore tres leches cake – it’s such a wonder. The process I’ve seen before this recipe is one that can take days – add a little, increase the moisture, etc. So fun. But I love this quick approach too! Anything doused in rum sounds good to me. 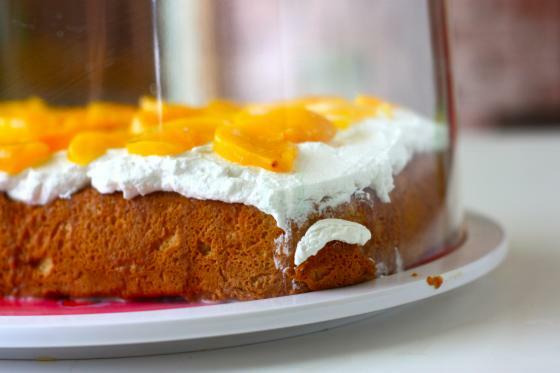 I’ve been meaning to try the Pioneer Woman’s tres leches cake, but haven’t gotten around to it yet. I’ve seen two recipes for tres leches cake this week though, so I think it’s a sign. It looks delish! A coworker of mine made this. She’s from Mexico and when I asked for the recipe she had to translate it into English for me. LOL But it was freaking delicious! She didn’t add the fruit to the top–I love that idea. I saw that cake pan at Target yesterday, and I almost bought it! Looks delish! tres leches intimidates me, but you made it look FABULOUS! i want to reach through the computer and take a bite! YUM! The irony – our local paper ran Ree’s recipe yesterday! I went out and bought the ingredients to make one for Mother’s Day! Never had it either – glad to hear it was good! Tres leches always reminds me of when I was a little girl. Growing up in a Mexican/Colombian household, it was always a special treat for my birthday! I’m glad you finally tried this delicious gem! Cinco de Mayo and National Day of Prayer really covers the party theme spectrum. I’ve never even heard of tres leche cake before but it looks amazing! I’m generally not a sweets person, but looking at those pics, it’s all I can do to keep myself from licking the computer screen. Scrumptious!! Lovely! 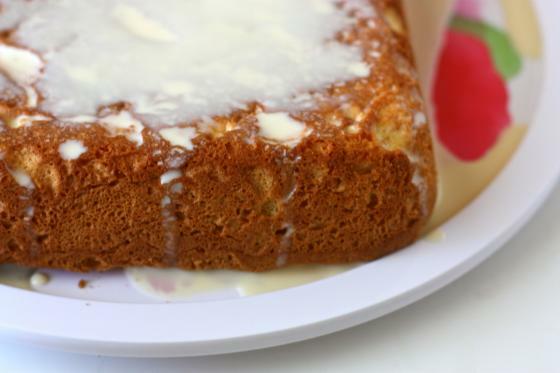 I’ve never tried a tres leches cake too, but sweetened condensed milk, um yes! yum. Maraschino cherries scare me too. I’ve wanted to make that for so long! I love PDub. I see babies and I think puppies too…its ok, furry friends are great. The cake looks great! Man, I wish I wasn’t lactose intolerant AND allergic to cherries! This seems like we would not be a good match 😉 but it does look heavenly! Tres Leches cake is one of my favorites! Yumm! OK, cinco de mayo/ national day or prayer is officially the most hilarious idea for a party theme ever. Oh! I’ve never tried tres leches cake, but it look amazing! Don’t think of it as soggy cake, think of it as the best vanilla ice cream you’ve ever had, with texture! 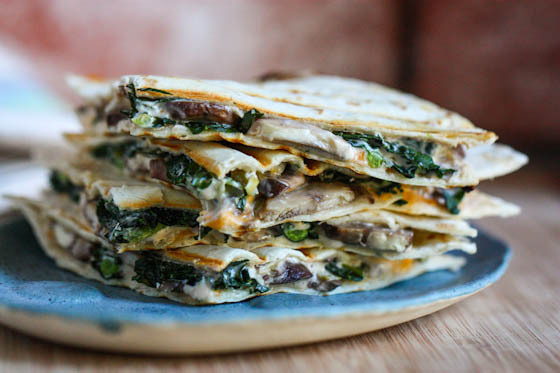 I’ve made this recipe and it’s easy and oh so delicious! Well this is simply a whole lotta lovely. Yum! I just finished making this and had a slice and it’s fabulous! This is my first time making and eating tres leches cake and it’s excellent. I topped mine off with strawberries since I think maraschino cherries are icky too. The Pioneer Woman ROCKS. Her monkey bread recipe is just…ridiculous. I feel a little emotional just thinking about it. I love Tres Leches cake (I am Peruvian, raised in South Florida- it is a staple just like flan!)!! Ree’s recipe is great too- and hers was the first recipe I tried. Great idea with the vanilla rum. I’ll have to try that. I discovered your blog not too long ago- and I love it!!! It’s pretty awesome!